← Bloodshot Records – Special Xmas Album! 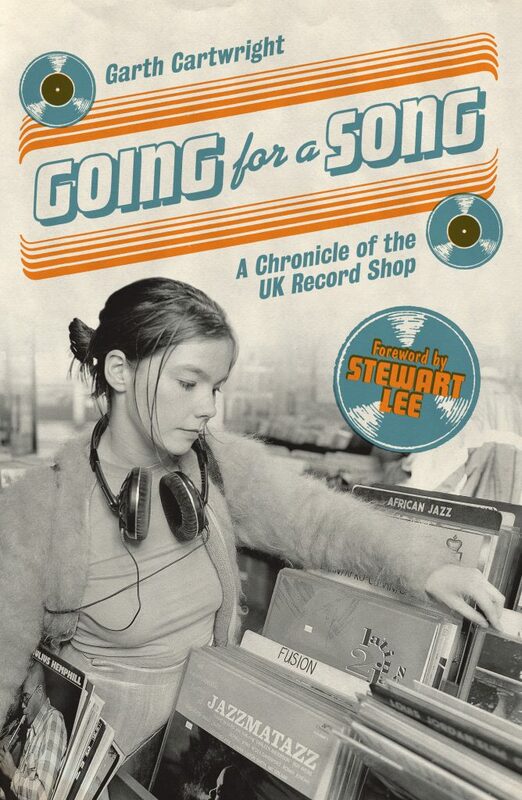 A new book by Garth Cartwright called ‘Going For A Song’ will explore the history of UK record shops – from the age of the wax cylinder to the days of dubstep and the recent resurgence of vinyl. It will describe how these fondly remembered stores across England, Wales, Scotland and Northern Ireland became musical oracles for the nation’s youth, transforming fashion and culture in the process. Cartwright is the author of several books and a regular contributor to BBC Radio 4, the BBC World Service, and he also writes for the Financial Times, The Sunday Times, Songlines, Record Collector and other international publications. The book covers the story of UK record-buying – from market traders selling music-hall 78s alongside Whitechapel’s shellac synagogues, through to HMV’s Oxford Street classical emporium and London’s post-World War Two, jazz, blues and folk specialist shops in London including famous names such as Dobell’s, Rays, Mole Jazz, Honest Jon’s, Rock On, Stearn’s and Colletts; Barry’s Record Rendezvous, Paul Marsh, Spinn Inn in Manchester (all regular haunts!) and many others throughout the UK such as Beano’s, Chris Wellard– even Woolies! The early 1970s finds Richard Branson’s Virgin shops leading a revolution in record retail, and Rough Trade, Beggars Banquet, Small Wonder and Good Vibrations launching their own punk record labels. Disco, reggae, techno and dubstep are all shaped by other shops. The CD boom fuels the megastores, and then downloading takes hold and the big chains crash. But then independent record shops rise again from the ruins, riding the vinyl revival and Record Store Day. In these UK record shops, friendships were forged, knowledge shared, bands formed, labels launched and music history made. ‘Going For A Song’ tells this incredible story for the first time. Never-before-published research finds a youthful Bob Dylan recording in the basement of Dobell’s, and East End villains unloading lorry loads of stolen albums via Carnaby Street. Meanwhile, race relations are tense in dub shacks, while African and Indian, Turkish and Albanian record vendors serve exotic sounds to their various immigrant communities. Along the way, David Bowie, Dusty Springfield, Danny Baker and Elton John all enter the music industry through jobs in record shops. Also appearing are John Peel (of course), B.B. King (a regular visitor to Dobell’s when in London), Bluebeat king Prince Buster, Ralph McTell, Joe Strummer, Bert Jansch, Malcolm McLaren, Lemmy, Phil Lynott, The Small Faces, Louis Armstrong and Sir Edward Elgar (alongside many other notable musicians, DJs, writers, hustlers and chancers). Garth has travelled the the UK to conduct more than 100 interviews with record-shop pioneers, trendsetting musicians and, of course, the customers. He conducted extensive research to trace the history of record retail across a century of unprecedented social, cultural and political change. The book is illustrated with dozens of great photographs, advertisements, record bags and other treasures from the golden age of record retail. Book available at the end of March, will be available in independent record shops and book shops around the UK and is being distributed by Proper. This entry was posted in 45 rpm, 78rpm, Americana, Blues, Books, Cassette, Compact Disc, Country/Hillbilly, Gospel, Jazz, Magazine, Rare Records, Rhythm & Blues, Rock, Rock & Roll, Roots, Soul, Vinyl, Website, World Music. Bookmark the permalink.